This month I will discuss the font tag and links. The first thing I will discuss is the font tag. 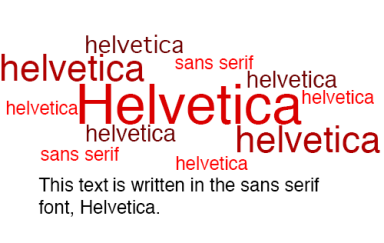 This tag as you may have guessed lets you change the font of the text on your page in a number of ways. You can change the typeface, the size and the colour. where “…” is the parameter list. The parameters you can set are face, size and color (note “color” as opposed to the English “colour” – it’s the American spelling). FACE sets the typeface (for example “times new roman” or “arial“). SIZE sets the size of the text. COLOR sets the colour of the text. If the viewer of your page has “font 1” on their computer then that is the font that will be used, if not then “font 2” will be used and so on until the end of the list is reached. If no fonts on the list match then the default font will be used. Color can be set using either hexadecimal notation or one of the predefined colours as discussed in the previous article. The next thing I will discuss is links. If you have ever surfed the Internet, you have encountered and are probably familiar with links. A link is a part of a page you click on to take you to another page. This page can be another page on the same site, a completely different page on a different site/server, another point on the same page. You can also link to an e-mail address. where “..” is the list of parameters and “link” is the contents of the page which will act as the link, meaning you can click on them and be taken to the specified web page. To specify the web page you use the “href” parameter. I will cover linking to another part of the same page next month. Can be text and/or image(s). The text will be underlined and the image will have a border around it. The colour of the text and the border is set in the body tag as described in the previous article.